Our logo depicts the topography and color of the Helderberg Mountain range when viewed from a distance. The sunflower represents the agricultural roots of the Hilltowns within and the welcoming nature of their residents. Helderberg Hilltowns Association began in late 2009 as Harold Miller, a Berne native now living in Mexico, built a network of individuals interested in forming an association of Hilltown farmers and business owners. The group would act as a virtual chamber of commerce for the Helderbergs, to promote low-impact, agricultural, recreational, and heritage tourism for an economic boost. The group has been active since 2010, working to connect Berne, Knox, Rensselaerville, and Westerlo and to promote a "live local" frame of mind. 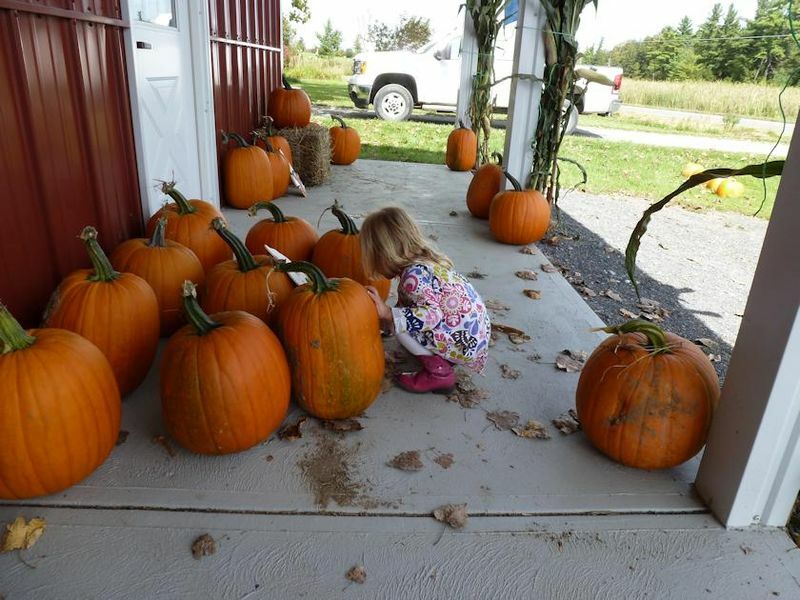 The Helderberg Hilltowns Association consists of neighbors from Berne, Knox, Rensselaerville and Westerlo working together to help preserve and promote local farms, businesses and organizations. We welcome everyone who is interested in the past, present, and future of the Hilltowns. See below for a link to meeting information. Join us as we to bring to light the story of local tenant farmers and their struggles under an oppressive feudal system of property ownership and taxation, birthed right here in Berne. The struggle eventually brought about land reform and influenced national politics, but the local effects of the feudal system are still being felt today. HHA is partnering with The Friends of the Berne Library and local historical societies to bring programming to to the public and students at Berne-Knox-Westerlo. Dates of events will be posted on this site and our Facebook page as they are scheduled. We meet at the Berne Public Library and recently donated The Emergent Agriculture: Farming, Sustainability and the Return of the Local Economy by Dr. Gary Kleppel of Knox. More about Gary's book here. 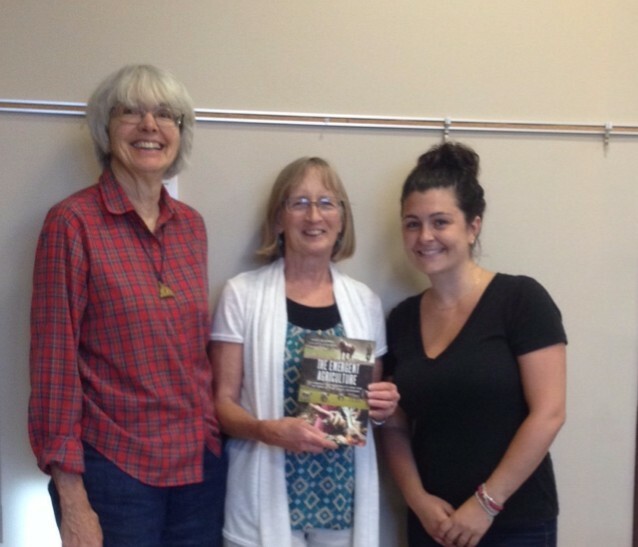 HHA representatives Dee Woessner and Jenn Geckler present the book to Library Director Judy Petrosillo. 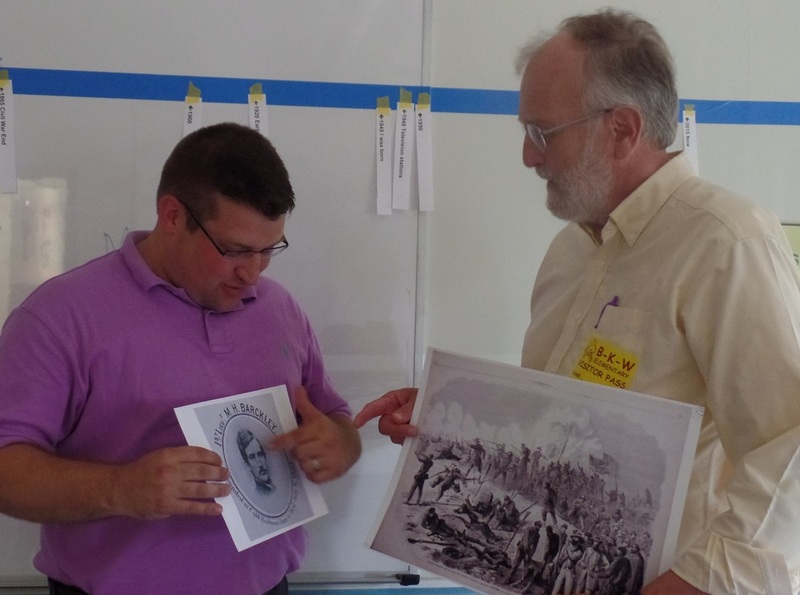 Fifth grade teacher Mark Tidd and HHA member John Elberfeld go over the Suitcases of History Civil War presentation. On June 22, 2015 John Elberfeld and Jane McLean took the story of Knox's Lt. Michael Barckley to the fifth grade classes at Berne-Knox-Westerlo school. The students used original sources, including a letter written by Barckley and a drawing of the Battle of Cold Harbor, to learn about local involvement in the Civil War. Suitcases of History is a collaborative effort with BKW, Helderberg Hilltowns Association, Berne Historical Society, and Knox Historical Society. Click on the buttons below to learn more about our programs and activities.